Evacuation plans are designed to get you to safety and quickly and efficiently as possible, and it’s always best to have a plan for everywhere you spend your time – at the very least, for most of us, that means developing a plan for our homes and our place of work. 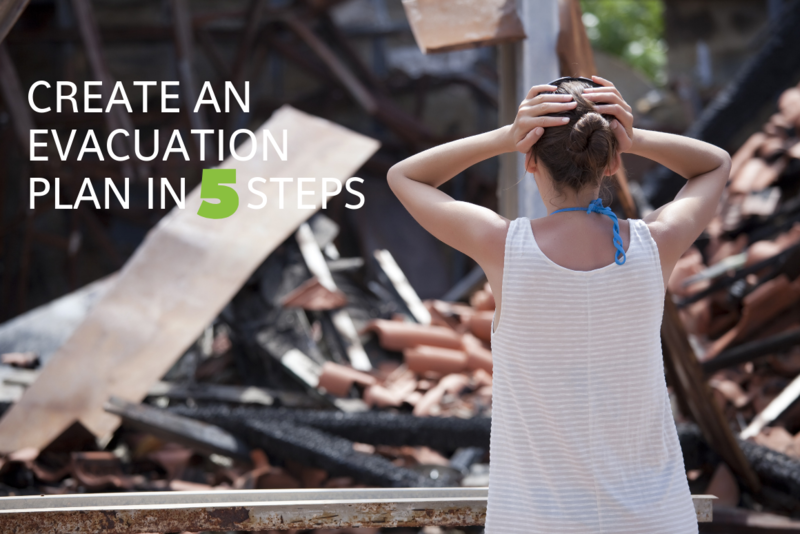 The latter might be provided by your employer, but in case it’s not, or you’re ready to prepare one for your home, here’s how to Create an Evacuation Plan in 5 Steps. There are many reasons why it might not be safe for you to remain in your home – from natural disasters like tornadoes, hurricanes, or earthquakes, to home emergencies like gas leaks, flooding, or fire. Familiarize yourself with the risks in your region, and keep those details in mind as you prepare to make your evacuation plan – the way you leave your home might differ, as will routes, or meeting places once you’re safely outside. Discuss potential meeting points for your family to head for in the event of an evacuation, with the type of disaster in mind, and consider adding one or two backup meeting places in case your first option is compromised. If you’re planning for a fire, you might want to choose a meeting spot outside of the house that you can walk quickly or run to; if you live in a coastal earthquake region, you will need to find a spot that’s on higher ground if you’re given a tsunami warning. Make sure everyone in your home or workplace is familiar with this meeting spot, or muster point, and knows when to use alternative meeting points in case you aren’t able to communicate with one another at the time. Once you’ve chosen your designated meeting spot(s), it’s time to figure out how you’re going to get there. Plan multiple ways to your destination, in case a route is unavailable in a disaster (for example, earthquakes and flooding can make roads impassable), and also plan for different modes of transportation (driving vs. walking vs. riding a bicycle). As part of your ongoing emergency preparedness efforts, every member of the household should familiarize themselves with, and practice, evacuation routes, so that it’s second nature when you have to use it in a real emergency. Finally, always make sure your vehicles are sufficiently fuelled to make it to any of your meeting points. It’s important to know how to communicate with your family if you become separated during a disaster or if you’re not together in the first place (which is probably a more common daily scenario). If phone networks are available, you should avoid making calls so that those who require emergency services can get through; if they’re not, the internet is a much more reliable way to communicate and gather information in an emergency – in fact, here’s How To Use Social Media To Communicate In Emergency. Depending on what you’re evacuating your home for, or how long you have to leave for, you’ll want to make sure that you have a “go-bag” prepared that you can pick up on your way out, and ensure that you have vital supplies to sustain you whether you’re headed to an emergency shelter, a second property, or a friend or family member. You can use a standard emergency supplies list to build your “go-bag” but remember to make it portable and suitable for carrying – this is especially important if you can’t drive anywhere.